In collaboration with the Grant County Outdoor Sport Alliance, the Southwest Tech Blue Line Club, and the Outdoor Heritage Education Center, Southwest Tech will be hosting the 7th annual Outdoor Skills Day on Saturday, Feb. 2. The family-friendly event is free and open to the public, operating from 10 a.m.-3 p.m. in the Ag/Auto Center on campus. 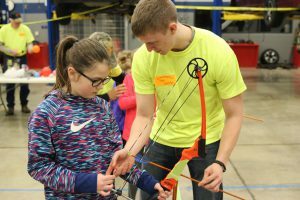 The day will include several skills stations such as archery, ice fishing, casting/fly rods, BB guns, and an outdoor skills challenge, among many more. Volunteers from the sponsoring organizations, including Southwest Tech students, will assist attendees through the stations. “We hope they enjoy the activities and decide they want to purchase hunting and fishing licenses and go pursue those activities on their own,” said Kelly Tollefson, president of the Grant County Outdoor Sport Alliance. Drawings will be held for door prizes and a food stand will be operational. Additional information can be found at www.swtc.edu/outdoorskills or by calling 608-822.5547.